Original art fine art pastel painting, 18" x 22"
​This painting comes unframed ready to frame with your personal touch. use a variety of fine art pastels, ranging from soft to hard. I use Rives BFK 100% rag vellum, known for its archival qualities. Packaged for safe delivery. I will ship it unframed protected under glassine between foamcore for protection. Original art fine art pastel painting, 16" x 20"
This painting comes unframed ready to frame with your personal touch. 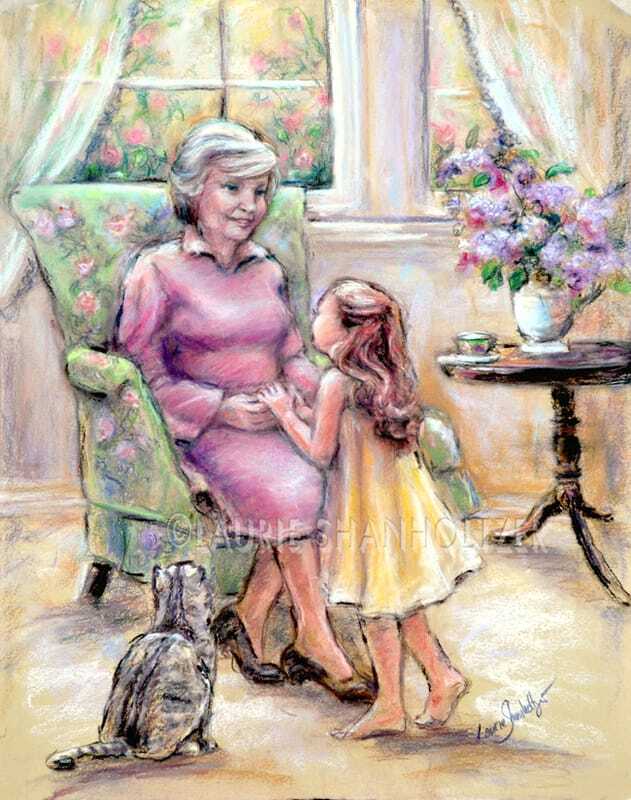 "GOOD MORNING SUNSHINE" Original pastel painting, 18"x21"
Original art fine art pastel painting, 18" x 21"
This original pastel painting size 11 .5 x 14. The painting comes unframed ready to frame with your personal touch .I use Rives BFK mould made 100% cotton rag. Neutral pH. tan. An assortment of pastels in various brands and hardness. A favorite time of each day, when your daughter would cuddle up in your lap for her bedtime story. I hope this will serve as a reminder that these are the good times. Pure joy!! 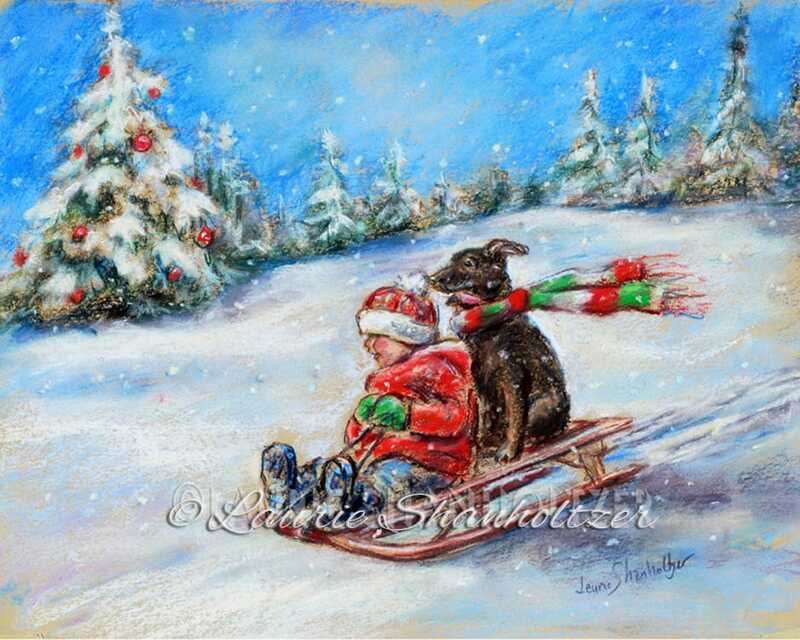 ,,,,You and your best friend sledding across the Christmas snow! I use a variety of fine art pastels, ranging from soft to hard. I use Rives BFK 100% rag vellum, known for its archival qualities. This original pastel painting size 14x18. This painting comes unframed ready to frame with your personal touch. On 100% cotton acid free paper, mouldmade in France. Using a variety of pastels from hard to super soft. I will ship it unframed protected under glassine between foamcore for protection. I will answer all questions about this work before shipment, since there are no returns on original works. This original pastel painting size 16 x 20 The painting comes unframed ready to frame with your personal touch .I use Rives BFK mould made 100% cotton rag. Neutral pH. tan. An assortment of pastels in various brands and hardness. Exhilaration, flying on horses, running full stride down the beach! Happy little girl dancing in the wind, The Autumn leaves swirling around her. Bathed in the beautiful fall colors of yellow, gold, red, orange and green! This is the first of 8 paintings and illustrations celebrating the 4 seasons. Four will be with little girls and four with little boys. This painting comes unframed ready to frame with your personal touch. On 100% cotton acid free paper, mouldmade in France. Using a variety of pastels from hard to super soft. I will ship it unframed protected under glassine between foamcore for protection. “BIRTH OF A DRAGON" Original painting 18 x 20". Original fine art painting measures 18 x 20". ~ Dawning of a new age… return of the mystical. "Are Your Sleeping Little Frog?" Original fine art painting measures 11x15". This painting comes unframed ready to frame with your personal touch. I use a variety of fine art pastels, ranging from soft to hard. "Are You Sleeping Little Frog?" On 100% cotton acid free paper, mouldmade in France. Using a variety of pastels from hard to super soft. "Snoozing On A Lazy Afternoon"
#9 in the "Sleepy Baby Animal Series"
"Bunny Asleep In Cabbage Patch"
Nap-time for our sleepy Bunny nestled in the cabbage leaves. Original fine art painting measures 11 x 15". Painting size 20 x 24 The painting comes unframed ready to frame with your personal touch .I use Rives BFK 100% cotton rag. An assortment of pastels in various brands and hardness. Family In The Rose Garden"
This original pastel painting size 17.5 x 23 The painting comes unframed ready to frame with your personal touch .I use Rives BFK mould made 100% cotton rag. Neutral pH. tan. An assortment of pastels in various brands and hardness. "Childhood Days at the Lake"
This original pastel painting size 18x22 The painting comes unframed ready to frame with your personal touch .I use Rives BFK mould made 100% cotton rag. Neutral pH. tan. An assortment of pastels in various brands and hardness. The happiest days of my childhood was by the lake at my cousin's house. The little girl in front could be an Olympic swimmer...we all start somewhere. I remember dashing into the water, being buried in the sand watching the teenagers flirting. This original pastel painting size 13.5 x 16 The painting comes unframed ready to frame with your personal touch .I use Rives BFK mould made 100% cotton rag. Neutral pH. tan. An assortment of pastels in various brands and hardness. Wherever we could find some space, the neighborhoods kids would gather for a little back lot baseball .Everyone joins in the neighborhood baseball game. Rules never worried us but we just had fun! This original pastel painting size 16x20 The painting comes unframed ready to frame with your personal touch .I use Rives BFK mould made 100% cotton rag. Neutral pH. tan. An assortment of pastels in various brands and hardness. Though small in stature, he is big and brave inside. The “big kids” are charging, but he will defend his goal.